Extremists exist in every ideology (there are too many to name but take the books March of the Titans (Kemp, 1999) to Testosterone Rex (Fine, 2017) as examples), but some are (in my opinion) more extreme (and funnier and more delusional) than others (even if they’re almost neck and neck). Afrocentrists veer toward the extreme side (as Nordicists veer to the extreme side on the opposite end). But certain beliefs these ideologies have may “sound right” to the uneducated ear, especially when they begin to weave fantastical stories with physiological terminology in order to woo the listener. You see things like “Melanin affects the idea of white supremacy“, but what does this really mean (you will see what it means near the end of this article)? The one saying it may believe it themselves, though it all doesn’t make sense. The extremist views that are more interesting are the Afrocentric ones, though, especially the melanin theory that gets thrown around in Afrocentric circles. Melanin is produced by melanocytes. Melanin is synthesized from L-tyrosine, with the help of tyrosinase, which is one of the main enzymes for melanin production (Solano, 2014; D’Mello et al, 2016). (See Cone, 2006 for a review of the melanocortin system.) Melanin absorbs energy from UV rays which then dissipate in the body as heat (de Monteallano, 1993). There are three types of melanin: eumelanin (there are two types of eumelanin: brown eumelanin and black eumelanin), pheomelanin (these two are present in the human epidermis; Thody et al, 1991; Solano, 2014) and neuromelanin. Pheomelanin and eumelanin are found in the hair and skin. Races that live closer to the equator have higher concentrations of melanin in their skin (not neuromelanin, which will be discussed later) which then causes dark skin pigmentation. But everyone on earth has around the same number of melanocytes; skin pigmentation differences come down to differences in UV exposure (for which melanin is useful; and produced due to UV radiation Brenner and Hearing, 2008), disease (albinism and vitiligo), size of melanocytes (see below) and genetic make up. Europeans and Chinese have about half as much melanin as African and Indian skin types, whereas Africans had the largest melanosomes, followed by the Indians, Mexicans, Chinese, and Europeans, therefore variation in melanosome size may also account for skin variation between races. It’s also interesting to note that people, no matter the skin color, who are born in high UV areas—regardless of ethnicity—have twice as much epidermal melanin compared to people born in low UV areas (Alaluf et al, 2002). Finally, there are the melanin theorists. a motley collection of pseudo-scientific cranks and better-known members of the black academic demimonde who attended the Fourth Annual World Melanin Conference in Dallas in April 1989—Leonard Jeffries, John Henrik Clarke, Ivan Van Sertima, and others. For these racial biologists, the pigment that makes skin dark is “the Chemical Key to Black Greatness” and accounts for an entire range of superior black aptitudes: “The reason why Black athletes do so well and have these ‘natural moves’ is these melanic tracks in the brainstem tie into the cerrebellum . . . a part of us that controls motor movement (Dr. Richard King). The real signifigance of the melanin theory is that it is the reductio ad absurdum of black racial seperatism, putting its adherents in a de facto alliance with white racists, who have their own reasons to establish separate racial physiologies. Afrocentric science curricula that promote melanin theory have been introduced in a nimber of urban school districts in the United States, thereby doing educational damage to those children who can least afford it. Note how there are similarities to Rushton and Templer’s (2012) hypothesis on the melanocortin system in darker-pigmented races (mainly blacks since that’s the race they theorized on). But what I find the funniest about melanin theory, as that some Afrocentrists use higher levels of melanin as “physiologic” proof that blacks are “superior athletes” (this can be explained without appealing to melanin). Though do note how the Afrocentric view of melanin and Rushton and Templer’s (2012) view of the melanocortin system and melanin are stark opposites of each other—and they’re both horribly wrong. Now let’s look at some quotes from some Afrocentric websites. The abundance of melanin in Black humans produces a superior organism both mentally and physically. Black infants sit, stand, crawl and walk sooner than whites, and demonstrate more advanced cognitive skills than their white counterparts because of their abundance of melanin. Melanin is the neuro-chemical basis foe what is called “SOUL” in Black people. Melanin refines the nervous system in such a way that messages from the brain reach other areas of the body more rapidly in Black people than in the other. In the same way Blacks excel in athletics, Blacks can excel in all other areas as well (like they did in the past!) once the road blocks are removed. The most in-depth take-down of Afrocentric melanist theories is from de Mantellano (1993). Afrocentric theory states that black people—and Egyptians because they were black too (they weren’t)—since they have higher levels of melanin in their skin, then this gives them physical and mental superiority over those with less melanin in their skin. They misinterpret (willingly or not) many papers in order to push their pseudo-scientific theories to the ignorant masses (which already is occurring in inner-city schools, widening the already wide science gaps; see de Manteallno, 1992). What Afrocentrists do not understand is that all humans have similar anounts of neuromelanin (which they wrongly conflate with skin melanin), while neuromelanin levels in the brain are also independent of melanin levels in the skin. So the fantastic claims of melanin causing physical and mental ‘superiority’ (whatever that is) for darker-skinned individuals is unfounded. Further claims from Afrocentrists are that since blacks have more skin melanin then this also means they have more melatonin and beta-melanocyte-stimulating hormone. Melatonin in humans also has no physiological relationship to skin color (de Mantellano, 1993). Lastly, Afrocentric melanists also state, as I have covered before, that Europeans are African albino mutants. In fact, the claim that whites are just African albino mutants is ridiculous. Whites can produce eumelanin, while albinos can’t. Albinos are also homozygous recessive—since albinism is a Mendelian disorder, one must be homozygous recessive for “the albinism gene” (de Mantellano, 1993: 42). They can mate forever and they will never create offspring with the ability to synthesize melanin. Therefore it is impossible for whites to have been African albinos. De Mantellano (1993) concludes that the theory is not to be taken seriously (of course) but states that “The idea that there are distinct races and that one is superior to the others is as racist and erroneous when it refers to high melanin levels as it was when it described low melanin levels (the Aryan “master race”)” (pg 54). Of course, no ‘master race’ exists, and the concept of ‘superiority’ has no basis in evolutionary biology, but race exists and is a biological reality. Though that doesn’t mean that any of the Afrocentric claims covered here have any basis—that’s because they conflate neuromelanin and melanin in the skin, even if they didn’t conflate the two they still would not be correct. The fatal flaw in this type of Afrocentric “reasoning” is that neuromelanin differs in structure, location, and biosynthesis from skin melanin. Afrocentrists assert that neuromelanin and skin melanin are correlated. Though what falsifies this assertion is that albinos have the same amount of neuromelanin in their brains as non-albinos. So all of the purported ‘mental and physical superiority’ that was ’caused by melanin’ makes no sense, because neuromelanin and skin melanin were conflated. Neuromelanin does not even have the physiologic effects that most Afrocentrists believe. Most Afrocentric melanists also cite individuals who cite…. rat studies and then extrapolate those results to humans. This is dumb. Yes I know the tired old “Humans are animals too!” but just because we’re animals too doesn’t mean that hormones work the same way in all species; it’s just some sort of bland appeal. The conspiracy to destroy black youth. . . . It has to do with the fact that in terms of genetics and genes that because Africans have dominant genes that it is very possible for Africans to annihilate the European population. And the best way to prevent the annihilation is to get to the root of the perpetrator who could do that. And that, of course, would be African men. Because it is men, specifically African men, that start the reproductive process off. For example, in looking at the four possibilities of sexual relationships. Of looking at those four there is only one possibility to produce a European child. If you have an African man with an African woman you will produce a child of color. If you have an African man with a European woman you will also produce a child of color. If you have a European man with an African woman that will also produce a child of color. European men can only produce a child that looks like them when they connect with a European woman. As the result of that, then, European men are very much afraid of African men and the conspiracy is directly centered at them. . . . And that’s that conspiracy is synonymous with the word genocide, and genocide not only is gradual, it is collective (Kunjufu, 1989). Other more outlandish ideas are quoted by de Mantellano (1993) too, and all of the claims made about the physiology of melanin, neuromelanin bringing supernatural, physical and mental powers are horribly flawed. These people have no understanding of the physiology of the hormone, nor what they’re really speaking about. These attempted physiological theories to attempt to show racial ‘superiority’ make absolutely no sense if one has a basic understanding of the physiological system. Claims made by Afrocentrists regarding melanin and neuromelanin range from blacks having more melanin in their muscle cells which is the cause for black athleticism; darker-eyed people having quicker reaction times which was thought to be caused by melanin; melanin centers in the brain being important for controlling and coordination of the body and brain power; to being critical for control of memory, motivation, mental maturation etc; causing altered states of consciousness which then causes black people who attend Church to speak in toungues; helps in the processing of memory; melanin and the pineal gland is at highest functionality in humans; and they conflate skin melanin with neuromelanin, when they are two different hormones (references for these claims can be found in de Montenallo, 1993). Psuedo-science about melanin is rampant, no matter which side one is on. Both sides make ridiculous assertions and leaps of logic regarding melanin, and I find it very amusing that each group is talking about the same thing while attempting to argue the polar opposite of what the other is arguing. These misconceptions come from no understanding of physiology, to ideological biases, to delusions of ‘superiority’ to just plain ignorance overall. Afrocentrist fairy tales most probably are widening and already-wide science gap between blacks and whites. Of course, race doesn’t really have any bearing on whether or not you’ll believe something, though of course, black kids are more susceptible to believing the fantastical stories and non-understandings of physiology that come from their inner-city teachers who will then indoctrinate them to their ideology. Correlations between skin pigmentation and neuromelanin are nonexistent. Further, there is no known physiological relationship between melatonin and skin color in humans. Therefore, the assertion that blacks have more melatonin due to their skin color and they then have this physical and mental superiority due to melanin has absolutely no scientific basis (even though those who push these types of theories have absolutely no understanding of the physiology of the hormone they are discussing). Racial pride ‘stories’ are harmful to science education; I don’t see March of the Titans being taught at schools (if I am in error let me know), but Afrocentric melanist theories are? The most important thing to take note of here is the similarities between Rushton and Templer (2012) and melanists. They mirror each other so well, they are talking about the same exact hormone, but both groups have wildly different conclusions. Rushton and Templer (2012) were driven by the (wrong) hypothesis that testosterone caused aggression and crime and that since a whole slew of animals that had dark pigmentation were aggressive, therefore this should apply to humans too because “Evolution doesn’t stop at the neck”, as most people say. On the other side, we have melanists making wild, almost sci-fi like claims about the power and magic of this one hormone in black bodies and only black bodies. To believe something like that you’d have to be either ignorant or highly biased. Melanism is clearly untenable, and Afrocentrists who push this ‘theory’ should take a few physiology classes and learn what this hormone does in the human body because they are woefully misinformed, reading books of pseudo-science. By RaceRealist in Melanin, physiology, Race Realism on March 23, 2018 .
afrocentrists are the only people more ridiculous than HBDers. I think they are even on the amount of absurdities though. 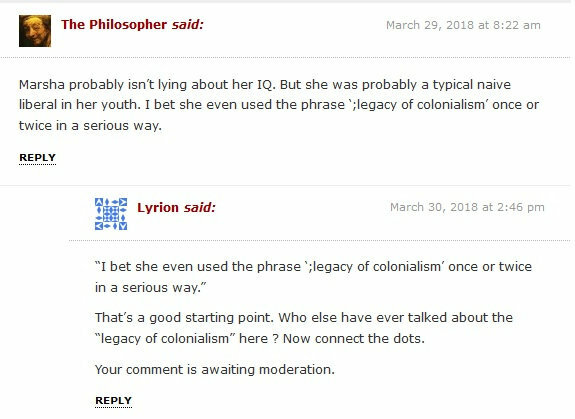 Comment stuck in moderation at PP’s blog, I wonder why. marsha = peepee = lyrion. PP have such a thin skin. whom do you think you’re fooling peepee? fool is a transitive verb. why is this? it’s very unlike other sports (which aren’t country club sports). the dominance of whites at “expensive” sports can be explained. i suppose. I’d say muscle stamina/fibers play some role.